This authentic aquamarine gemstone is a beautiful frosty blue color that will remind you of your childhood with this fun and playful 1 carat tension-set aquamarine ring in 14K yellow gold. Apples of Gold Jewelry does it again with this original design! The tension-set setting for the A rated, 6.5mmm stunning, glacial blue aquamarine stone makes it look as if it is held in place by pure magic! The twist of the yellow gold band creates a fun illusion for this beautiful ring. 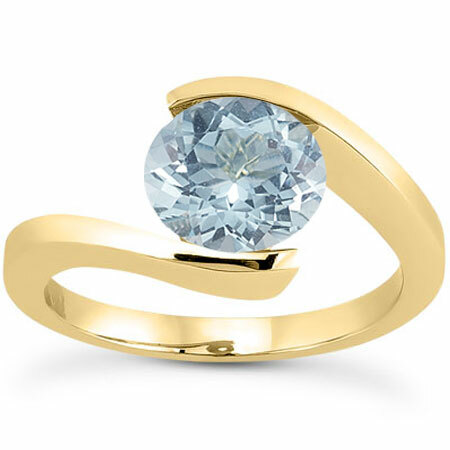 We guarantee our 1 Carat Tension-Set Aquamarine Ring, 14K Yellow Gold to be high quality, authentic jewelry, as described above.